The fall season was a busy time for NCAA gymnasts competing elite. We’ve compiled all the action so you can keep tabs on all your old and new NCAA faves! To many NCAA fans, the most exciting news of the fall season was Danusia Francis’ return to elite training. Francis, a 2016 UCLA graduate who scored two perfect 10s in her career, has competed internationally for Jamaica since 2015 and represented it at worlds that year. She intends to make her competitive return as a guest at the English Championships in February. Instagram footage shows she’ll debut a new floor routine and that she’s gotten her trademark transverse side aerial to back layout full dismount back! Former Iowa bars star Johanny Sotillo also returned to competition in November, surprising many by appearing in the results of the Bolivarian Games. Representing her native Venezuela, Sotillo placed 10th in the all around and made two event finals. It’s not known if Sotillo plans to remain in the sport or if this was a one-time offer to help her team; Venezuela’s biggest elite star, Jessica Lopez, is currently busy as a volunteer assistant coach at Denver. Bridgeport class of 2014 graduate Melissa Doucette made headlines when she attempted to qualify elite after college, but many fans lost track of her when she switched to power tumbling. 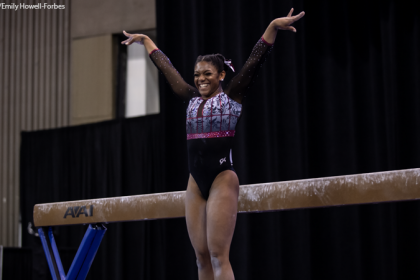 Excitingly, Doucette was selected to the U.S. team for T&T worlds. She placed 20th in qualifications and third among the U.S. women. The team went on to finish fourth. While Doucette didn’t make the individual final this year, going so far in only her first year in the sport is an incredible accomplishment—and at 26 she’s still improving. Autumn is the busiest time of year for many British elites, with a long series of domestic and smaller international meets leading up to the English and British Championships in the early spring. This year, three NCAA commits were active, all of whom train at The Academy. Iowa State signee Phoebe Turner finished eighth in the all around at the Dutch Women’s Invitational in September and went on to win bronze on vault with a difficult double-twisting Yurchenko and front handspring front tuck. (She has competed this vault with a half twist in the past.) Her floor routine started from a 14.9, and while video isn’t available for this routine, she typically competes a triple twist and front double full. Turner also saw action at the Rushmoor Rosebowl, an important domestic meet, finishing sixth. The level of difficulty that she competes, just over a year before her collegiate debut, could be a huge asset for the Cyclones. Junior star and California commit Amelie Morgan has had a busy year, competing at five meets since July. Most recently, she won the all around title at Olympic Hopes and finished fifth at Top Gym, picking up the floor title at both meets. 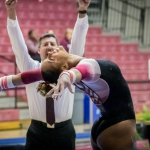 Arguably the most impressive feature of her fall season was the beam routine that she showed at Olympic Hopes, which featured a back handspring mount connected to a back handspring layout step-out series. Her routines are difficult and beautiful but are also well within her abilities. Her gym has sent gymnasts to the last three Olympics, so clearly it knows how to pace gymnasts correctly—and with such outstanding junior results, it’s not inconceivable that Morgan could head in the same direction. The most recent NCAA commit from Great Britain, Phoebe Jakubczyk (Oregon State), joined Morgan at both Olympic Hopes and Top Gym. Jakubczyk is a powerful, dynamic gymnast who seems to be progressing steadily and safely. She won the beam title at Olympic Hopes, but her biggest asset as a college commit might be her floor routine. She tumbles a double pike, one and a half twist to front pike and double tuck securely. If the Beavers had the option, they might elect to put her in the floor lineup this year rather than wait until 2021. All three represented The Academy at the Adrian Stan British Team Championships, securing the team silver. In addition, Turner won the individual all around bronze in the senior division and Morgan took silver in the juniors. Head coach Liz Kincaid believes strongly in the importance of NCAA gymnastics as an option for gymnasts who might not become international stars, and with six current and future scholarship recipients from her squad, it’s exciting to see her advocacy paying off. American junior elite and North Carolina commit Tienna Nguyen represented Vietnam at Olympic Hopes, ranking 12th in the all around and competing in three event finals. Unfortunately, there doesn’t seem to be video available of Nguyen’s performance of this meet, but her career trajectory is quite interesting. After a difficult American elite summer, representing Vietnam is a great opportunity to gain experience. Her more difficult elite skills can cause her problems, but her basics are beautiful. 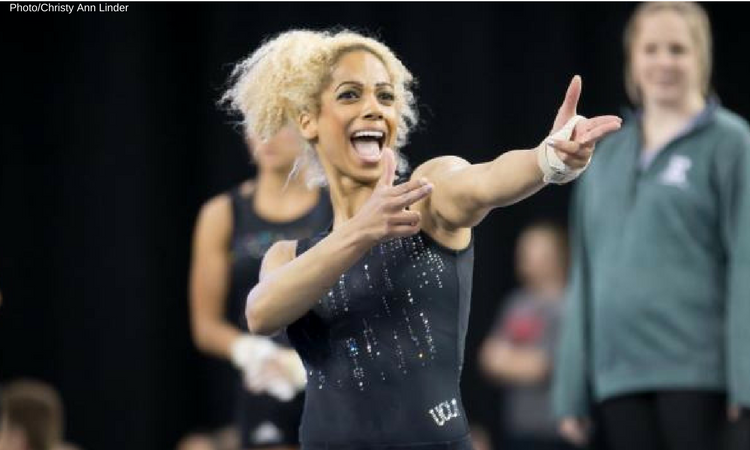 It’ll be interesting to see if she drops back to level 10 in the U.S. and continues competing internationally for Vietnam in the offseason, as many successful NCAA gymnasts have done in the past. 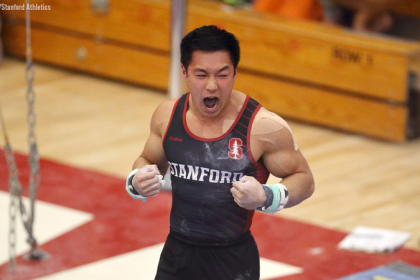 Make sure to keep checking NCAA Gym News for more updates as we rapidly approach the end of the 2017 offseason!